The Loa are the children of Lusa (Lisa) and Mawu, members of an extra-dimensional race of beings known as the Orishas who were worshipped as gods by the natives of ancient Africa. The Orishas were the deities of the myriad Afrikaan tribes of Africa, but by in the 17th Century, Europeans invading the continent began abducting and taking whole tribes to use as servile servants or slaves in Europe and the Americas. Many slaves were removed from the Yoruba, Fon, Ewe, Dahomey tribes of Africa to use as slaves. Several Afrikaans were treated respectively, but countless more were reduced to servile positions with little or no regard to their human conditions. The Africans called out to their ancient deities for solace, even combining tenets of Catholicism and the Holy Roman Church into their rites, and the god Legba rallied his brothers and sisters into granting hope and promise to their suffering worshippers as the Loa. Worship of the Loa eventually became the religion of Voodoo through the descendants of the Africans removed from their homeland although the gods Damballah and Sagbata introduced some sinister and malevolent aspects to the religion. Today, Voodoo and its rival practice of Santeria is practiced in most of the Caribbean and along the Gulf of Mexico down into South America. Most worshippers of Voodoo are African in origin, although some people of European descent have tapped into the darker arts of the religion for materialistic gains. Some of the most powerful practitioners of Voodoo are Jericho Drumm and Marie LaVeau. Several members of the Loa have the ability to tap into and manipulate mystical energies, usually some where along the lines of their position or expertise, i.e. Damballah can tap into the power of the underworld while Shango can manipulate the forces of the weather. The majority of the Loa have certain powers in common such as traveling between dimensions, such as from Ala to Earth, and altering their appearance. The majority of the Loa are described here. Shango, Damballah and Sagbata have entries elsewhere. Identity: The general populace of Earth is unaware of the existence of Avlekete except as a mythological deity. History: Avlekete is the goddess of the sea, daughter of Lusa (Lisa) and Mawu and wife of Olokun, the sea-god. She supported Legba over giving power of the Loa to a mortal as a force of good against the evil unleashed by their brother Sagbata. Strength Level: Avlekete possesses superhuman strength enabling her to lift (press) 25 tons under optimal conditions. Known Superhuman Powers: Avlekete possesses the conventional physical attributes of the African gods. She also has a mystical ability to control and manipulate water. Identity: The general populace of Earth is unaware of the existence of Ayaba except as a mythological deity. First Appearance: Ayaba has yet to appear in the Marvel or DC Universes. History: Ayaba is the goddess of home and the hearth. Her duty was to protecting the home and its residents. Strength Level: Ayaba possesses superhuman strength enabling her to lift (press) 25 tons under optimal conditions. Known Superhuman Powers: Ayaba possesses the conventional attributes of the Gods of Africa. She has minor mystical abilities of an unknown nature enabling her to cast spells of protection on her worshippers. Identity: The general populace of Earth is unaware of the existence of Erzulie except as a mythological deity. She is well-known in Africa and to practitioners of Voodoo. History: Erzulie is the goddess of love and sexuality and daughter of Lusa (Lisa) and Mawu. Counted as one of the most beautiful of the Loa, she was often compared to the Olympian Aphrodite and the Asgardian Freya and known for sexual affairs with Ogun, Damballah and Olokun in his guise as the Haitian god Agwe. Erzulie supported Legba over giving power of the Loa to a mortal as a force of good against the evil unleashed by their brother Sagbata. Strength Level: Erzulie possesses superhuman strength enabling her to lift (press) 25 tons under optimal conditions. Known Superhuman Powers: Erzulie possesses the conventional attributes of the Gods of Africa. She can also tap into and manipulate mystical energies allowing her to control the emotions of others and to create love spells and enchantments. Identity: The general populace of Earth is unaware of the existence of Eschu except as a mythological deity. History: Eschu is the trickster-god and son of Lusa (Lisa) and Mawu. Often sent to test the true characteristics of mortals, he primarily served as a servant of Oloddumare. He supported Legba over giving power of the Loa to a mortal as a force of good against the evil unleashed by their brother Sagbata. His sacred animal is the dog. Strength Level: Eschu possesses superhuman strength enabling her to lift (press) 30 tons under optimal conditions. Known Superhuman Powers: Eschu possesses the conventional attributes of the Gods of Africa. He also possesses latent abilities to tap into manipulate mystical energies, but to an unknown degree. Identity: The general populace of Earth is unaware of the existence of Faa except as a mythological deity. First Appearance: Faa has yet to appear in the Marvel or DC Universes. History: Faa is the goddess of destiny and prophecy. Endowed with gifts of prophecy, she weighed the souls of mortals who had died to determine their fate in the afterlife. She also granted visions upon those who knew how to call upon her. Strength Level: Faa possesses superhuman strength enabling her to lift (press) 25 tons under optimal conditions. Known Superhuman Powers: Faa possesses the conventional attributes of the Gods of Africa. She also has limited abilities to practice magic. She is also a powerful clairvoyant capable of glimpsing possible but not improbable alternate futures which she can telepathically share with her worshippers. Identity: The general populace of Earth is unaware of the existence of Gou except as a mythological deity. History: Gou is the god of the moon and son of Lusa (Lisa) and Mawu. Also revered as a god of war, he supported Legba over giving power of the Loa to a mortal as a force of good against the evil unleashed by their brother Sagbata. Strength Level: Gou possesses superhuman strength enabling her to lift (press) 45 tons under optimal conditions. Known Superhuman Powers: Gou possesses the conventional attributes of the Gods of Africa. He has greater strength, stamina, endurance and resistance to injury than the majority of the Orishas. Identity: The general populace of Earth is unaware of the existence of Legba except as a mythological deity. He is well-known in Africa and to practitioners of Voodoo. History: Legba is the Chief of the Loa and god of roads and travelers, and son of Lusa (Lisa) and Mawu, who often sent him to convey messages from Afe to Earth. He was also master of the Loa and his duties involved escorting mortal souls to a peaceful afterlife after physical death. After Sagbata invoked Chthon the Elder God, he joined forces with the other gods of the Vodu to create a force of good against the evil unleashed by his brother. He gave the mortal man, Laureant, power of the Loa by means of an ultimate spell he obtained from Gaea, the Earth mother. Laureant then became the original Brother Voodoo, the first mortal lord of the Loa. Strength Level: Legba possesses superhuman strength enabling her to lift (press) 40 tons under optimal conditions. Known Superhuman Powers: Legba possesses the conventional attributes of the Gods of Africa. He also has mystical abilities to tap into and manipulate mystical energies. He is possibly the most invoked Loa in Voodoo and can open portals between dimensions, cast spells and hexes, induce illusions and cast his voice and image across great distances. Identity: The general populace of Earth is unaware of the existence of Loco except as a mythological deity. First Appearance: Loco has yet to appear in the Marvel or DC Universes. History: Loco is the god of health and medicine. He had a variety of names to protect and cure his worshippers from plague and disease. 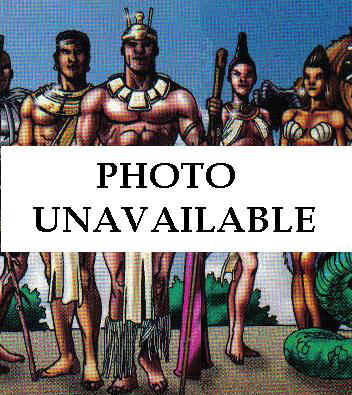 In this role, he supported Shango and Legba against the evil of Damballah and Sagbata. Strength Level: Loco possesses superhuman strength enabling her to lift (press) 30 tons under optimal conditions. Known Superhuman Powers: Loco possesses the conventional attributes of the Gods of Africa. He also has mystical abilities enabling him to cure and heal the sick. He also has precognitive abilities to deduce the origins of illness even of mystical origin. Identity: The general populace of Earth is unaware of the existence of Maou except as a mythological deity. History: Maou is the god of the sun and the son of Lusa (Lisa) and Mawu. He supported Legba over giving power of the Loa to a mortal as a force of good against the evil unleashed by their brother Sagbata. Strength Level: Maou possesses superhuman strength enabling her to lift (press) 30 tons under optimal conditions. Known Superhuman Powers: Maou possesses the conventional attributes of the Gods of Africa. He can also mystically create light and heat equivalent to a small sun. Identity: The general populace of Earth is unaware of the existence of Ogun except as a mythological deity. He is well-known in Africa and to practitioners of Voodoo. History: Ogun is the blacksmith-god of iron and son of Lusa (Lisa) and Mawu. He was also a god of warriors and hunters, and when Oludumare visited Earth for the first time, he was the only deity prepared with a machete to cleave a way through the wilderness to lead the gods. He supported Legba over giving power of the Loa to a mortal as a force of good against the evil unleashed by their brother Sagbata. Strength Level: Ogun possesses superhuman strength enabling her to lift (press) 35 tons under optimal conditions. Known Superhuman Powers: Ogun possesses the conventional attributes of the Gods of Africa. He has limited mystical abilities to cast enchantments on mystical objects. Identity: The general populace of Earth is unaware of the existence of Zaca except as a mythological deity. First Appearance: Zaca has yet to appear in the Marvel or DC Universes. History: Zaca is the god of the harvest and agriculture. His worshippers called upon him to ensure a bountiful harvest and the fertility of the earth. He opposed Sagbata in his personification of drought and pestilence on earth. Strength Level: Zaca possesses superhuman strength enabling her to lift (press) 30 tons under optimal conditions. Known Superhuman Powers: Zaca possesses the conventional attributes of the Gods of Africa. He also has mystical abilities enabling him to control the prosperity of plants, particularly wheat and corn, and the properties of the soil it grows.